The SLACKLINE SERIES is a unique practice that redefines your sense of balance and mental focus on a one inch wide piece of webbing! Great for climbers, yogis, surfers, runners and athletes of all forms, the YogaSlackers bring their unique practice of slackasana to climbing gyms and yoga studios around the world. This practice helps students to develop new techniques of complete body awareness and strength while improving concentration, so much so that some have labeled it “meditation for those who can’t sit still”. In this 2 hour workshop, students will learn the basics of the series including poses such as kneeling, sitting, standing, lying down, arm balancing and even going upside down on the slackline. Often times the practice is combined with AcroYoga and Thai Massage to offer a full exploration into balance and holistic well-being. Meet at Academy Green, on the corner of Clinton Ave. & Albany Ave. 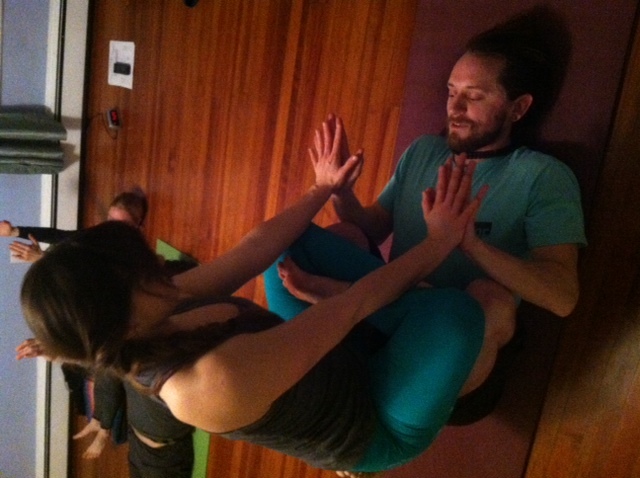 If it’s raining, meet at The Yoga House on Crown Street, where we’ll do AcroYoga guided by Adi. Adi has been a life long student of practicing yoga off the mat in all shapes and forms especially when it involves being outdoors. Her passion for movement and the environment have taken her on countless adventures around the world and she currently travels and teaches as part of the YogaSlackers & created the Redefining Balance series and retreats to share the modalities of shifting perspective through yoga, slacklining, AcroYoga, climbing, surfing, mountain biking and just about anything else you can think to do on the Earth’s terrain. Traveling & teaching often times with her car as a home base, you can find her somewhere in the vicinity of an ocean, climb site, mountain or legit climbing tree as she works with students on and off the mat to discover a new sense of balance, strength and focus in whatever their form of practice might be. Read more at AdiCarter.com. We’re happy to announce that we are now hosting a weekly Acro-Yoga meetup! Every Sunday from 6:30-7:30 P.M.
By donation. All levels welcome. No experience necessary. All proceeds will go toward funding the meet-up itself. 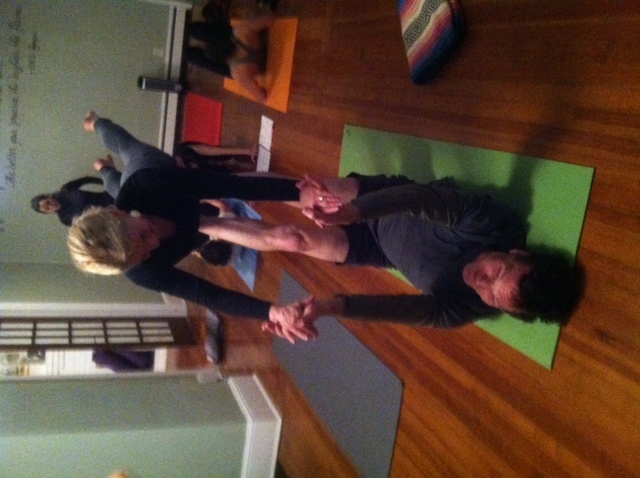 It’s partner yoga that uses elements of yoga, acrobatics, and Thai Yoga Massage. It’s delightfully adventurous and healing all at once. It’s performed in groups of three: a base, a flyer, and a spotter. We’ll alternate roles so that everyone gets a chance in every role. This is an informal meet-up. A teacher will be present to oversee the group. We’ll choose between three and five poses from the AcroYoga Manual to practice each week. We can lead and assist you if you need guidance or you can be self-guided. Come by yourself, or bring a friend. You can work with your partner exclusively, or we can mix it up.